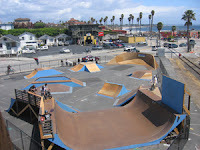 Hey BMXers & freeriders, Santa Cruz Parks and Recreation now has a new Bike Park! Thanks also to the Bicycle Trip for funding the park. 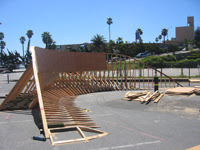 Some features include a bowed 8' high wall ride and 2' and 4' jumps. Its right across the street from the Santa Cruz Municipal Wharf (35 Pacific Avenue). Its open from 9 a.m. to sunset daily and all bike riders must wear a helmet and safety pads. Skateboarders, in-line skaters and scooters are not allowed in the Bike Park. The Bike Park will be closed during rainy or wet conditions. Eventually a Marine Sanctuary Visitor Center will be built on this site, and the bike park may be moved to a permanent location. The descision depends on the city parks department. Photos from the Parks & Rec website, courtesy of Susan Harris.